'Grant of GP 5400 to Senior Section Officer of Railways & AADs of IA&AD and organised Accounts (Civil Accounts Postal Accounts and Defence Accounts)' is one of the fifteen points agenda for the National Anomaly Committee meeting based on 7th CPC. New Delhi: Shiva Gopal Mishra, Secretary, National Council (Staff Side) JCA, for Central Government Employees has submitted fifteen important items for inclusion in the agenda for the National Anomaly Committee meeting based on 7th CPC Anomaly on August 16, 2017 to Dy. Secretary - JCA, Department of Personnel & Training. In Para 11.40.83 of its report, the 7 CPC has recommended the following: in line with our recommendations for organised Accounts Cadres, it is further recommend that the employees in Grade Pay 4800 should be upgraded on completion of 4 years’ service, to the existing GP 5400 (PB-2) VIZ., Level 9 in the Pay Matrix, on non functional basis". 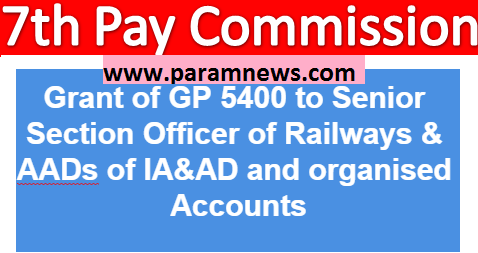 Under the sub-heading ”Organised Accounts Staff” the 7 CPC has recommended the following: 11.12.40 The Commission is therefore of the view that there is no justification for excluding officers in the organised accounting departments who ate at GP 4800 from this dispensation. It therefore recommends that all officers in organised accounts cadres (in the Indian Audit and Accounts Department, Defence Accounts Department, Indian Civil Accounts organization, Railways, Posts and Telecommunications) who are in GP 4800 should be upgraded, on completion of four years' service to GP 5400 (PB-2), viz., Pay Level 9, in the pay matrix." This recommendation of the 7 CPC has not been implemented yet, leading to an anomalous situation which may be resolved without delay. Grant of GP 5400 to Senior Section Officer of Railways & AADs of IA&AD and organised Accounts (Civil Accounts Postal Accounts and Defence Accounts) is one of the fifteen points agenda for the National Anomaly Committee meeting based on 7th CPC.